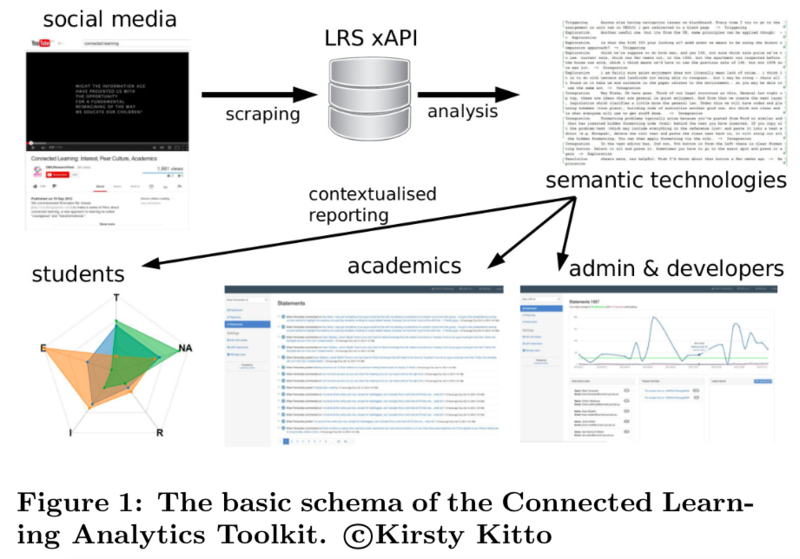 Just kicking off, a project funded by Australian OLT which I’ve long been dreaming about under the heading of Social Learning Analytics [1-2], and now brought to life by Kirsty Kitto and her team at QUT, in collaboration with Mandy Lupton who is developing the concept of teaching+learning in the wild. K. Kitto, S. Cross, Z. Waters & M. Lupton. Learning Analytics beyond the LMS: the Connected Learning Analytics Toolkit. Learning Analytics and Knowledge (LAK’15), In Press, ACM. And if you want to go and check out the source code, then it is available on GitHub.